Stress is naturally a part of life. Some stresses can be beneficial at times as they drive you to push yourself and help other people pull through challenging situations. 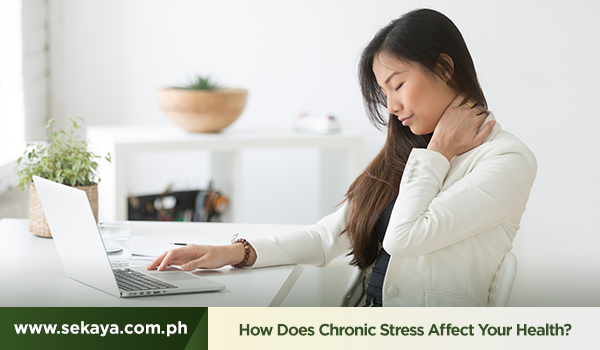 Chronic stress, however, can damage or do harm to your health and overall well-being. Here’s what you need to know. The body is hard-wired to react to stress in ways meant to protect you. A read from Dr. Axe explains that when a threat is perceived, the brain sets off an alarm system in the body that sends certain metabolic processes into overdrive. This is the fight or flightresponse of the body, and it will interfere with some functions in the body upuntil the difficult situation is over. After a threat has passed,the brain releases signals to undo the temporary functional changes it hadcalled for. But when you’re under constant pressure, such as shoulderingoverwhelming workloads, it prolongs this unnatural emergency system, andactually causes harm to your health. Chronic stress messes with your cognitive functions. According to the University of Maryland Medical Center (UMMC), chronic stress makes it difficult to concentrate, with effects on your memory and learning. Risk factors for heart attacks, heart diseases and stroke are increased due to the constricting of arteries, the increase of the heart rate, and the thickening of the blood. Because the immune system is put on pause, you are more susceptible to infections. Chronic stress accelerates skin-ageing. To increase pain tolerance during an emergency situation, blood is channelled away from the skin. The lack of blood flow results to skin pigmentation and a blotchy complexion. Digestive disorders such as bloating, cramping and diarrhea are also possibilities. When you’re in a constant state of panic, it keeps you up and unnaturally alert. You lose sleep, become irritable and fatigued. Every day is peppered withstressors that will trigger your fight or flight response. But while you can’tcompletely erase stress from your day, there are definitely ways to manage andminimize.